Title screen (very dim, click on image for better quality). This is the first game in the Star Wars series. For other games in the series see the Star Wars category. For the Japan-only Famicom game, see Star Wars (Namco). For the game by JVC, see Star Wars (JVC). 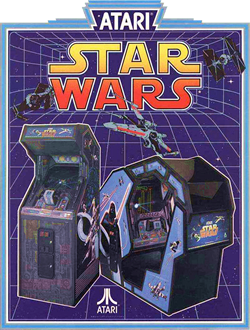 Star Wars is an arcade game produced by Atari Inc. and released in 1983. The game is a FPS spacecraft simulator, simulating the attack on the Death Star from the final act of Star Wars - Episode IV: A New Hope. The game is composed of 3D color vector graphics. In the first phase of the game, the player begins in outer space above the Death Star. He must engage in a dog fight with Darth Vader and enemy TIE fighters. In the second phase (occurring beginning with the second wave), the player reaches the Death Star's surface as laser turrets on towers rise to confront the player. If the player manages to destroy all of the towers, he will receive a sizeable point bonus. In the final scenario, the player finds himself speeding through the trench of the Death Star, avoiding obstacles and blasting gun turrets until, finally firing a proton torpedo at the correct time for a direct hit on the exhaust port target. What follows, if the player is successful, is the Death Star exploding in a multitude of different colors, plus the awarding of one bonus shield (on factory settings). If the player manages to destroy the Death Star without firing at anything but the exhaust port, he will receive a sizeable point bonus for "using the force." Then it is on to do battle again. Each successive Death Star run greatly increases the difficulty; TIE Fighters shoot more often, there are more Laser towers and batteries in the second round, and there are many more obstacles and laser fire during the trench run. Unlike the movie, where the units shoot beams similar to lasers, the enemy units in this game shoot projectiles resembling fireballs, in order to give the player a chance to destroy the fired shots. The game features several digitized samples of voices from the movie, including Mark Hamill as Luke Skywalker, Alec Guinness as Obi-Wan Kenobi, James Earl Jones as Darth Vader, Harrison Ford as Han Solo, the mechanized beeps of R2-D2, and the growls of Chewbacca. The game is available as a standard upright or a sit-down cockpit version, both of which are elaborately decorated. The controls consist of a yoke control (similar to a steering wheel — twisting left and right gives combined roll and yaw; twisting forwards and backwards with the side control gives pitch) with four buttons — two trigger style and two in position to be pressed by the thumbs — each of which fired a laser positioned on the four leading edges of the X-Wings. The game was ported first by Parker Brothers in 1983 and 1984 to numerous 8-bit consoles and computers. These include the Atari 2600, Atari 5200, the Atari 8-bit family, ColecoVision and Commodore 64. It was ported again, in 1987 and 1988, utilizing more advanced graphics and sound capabilities of 16-bit systems of the era. Versions appeared for the Amiga, Atari ST, Amstrad CPC, ZX Spectrum, Acorn Electron, BBC Micro and Enterprise 64; the game was also ported again for the Atari 8-bits and Commodore 64. All ports were developed by UK-based Vektor Grafix (the Atari 8-bit version by Zeppelin Games being an exception) and were published in Europe by Domark. That same year Brøderbund acquired the rights to develop Star Wars games from Lucasfilm. Brøderbund published the Apple II, Apple Macintosh, Commodore 64 and DOS versions of the arcade game in North America in 1988. Amiga and Atari ST versions are very similar to the arcade original. They allow the ability to use mouse control and feature digitized sound effects. The Macintosh version contains sampled speech from the films, but has no in-game music other than a monophonic theme during the "attract" mode. This game, along with The Empire Strikes Back and Return of the Jedi, was also included as an unlockable extra in the Nintendo GameCube game Star Wars Rogue Squadron III: Rebel Strike. In the United States and some European countries, customers could get the Nintendo GameCube version of this game for free when they pre-ordered Star Wars Rogue Squadron III: Rebel Strike. 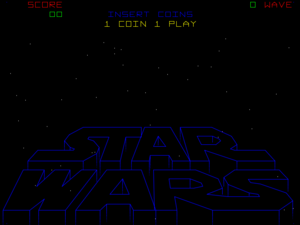 A fan-based remake of this game which is similar in gameplay was released on the Vectrex in 1999 by John Dondzila called "Star Fire Spirits" as part of his "Vecmania" cartridge set. This page was last edited on 8 March 2016, at 21:03.